If you have been following me on Instagram, you've probably realized that I’m on vacation at my parent’s lake house (or at least I was last week.. I’m heading home today.) And of course, like any good DIY’r I can’t just relax while on vacation. I have to keep myself busy with little projects. 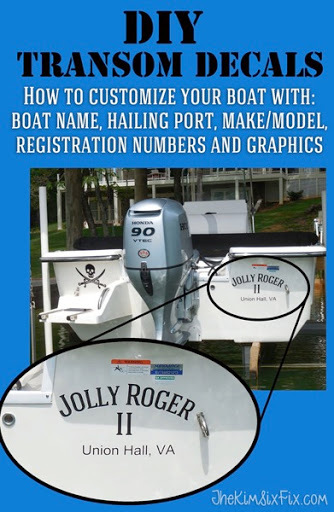 So when I realized that my dad’s fishing boat hadn’t yet been christened with it’s given name, I decided to use my mom’s Silhouette to create some permanent vinyl decals for the transom. So I had to make the lettering smaller and wanted to add something to the other side of the transom, to balance it out. Of course, we settled on the Skull and Crossbones. The best part is that the entire project was less than $5 (hundreds less than a custom paint job and about 25% of the cost of ordering a custom vinyl decal online.) Needless to say, I have a very JOLLY ROGER in my family now. The skull is approximately 13 inches (wide) by 10 inches (high) while the letters are approximately 3 inches tall (the hailing port lettering is closer to 1.5 inches tall). The vinyl is Oracal 651 in glossy black and was transferred with Silhouette brand Transfer Paper. The decals should be permanent and withstand both the sun and water, but they can be removed with a razor blade if that is ever required. For the step by step instructions on working with vinyl, you can see my Kitchen Aid Mixer post.